Do you remember a couple weeks ago, I transferred a picture of a little girl onto canvas? Nellie and Marianne has introduced lots of new Vintage Prints of beautiful images ($1.00 each) that I dearly love. These sheets are like magazine pages which I wouldn't want to put on my card. So, I have been thinking for several days what I could do with them to make them look nicer and more usable on a card. I spent several hours trying different things, but I finally "got it" and I am so excited as I think this will allow us a whole new venture in our card making and scrapbooking. 3. Lay this on top and burnish it with your finger. 4. Spritz water onto the back of the Vintage image. Let it soak a bit and then start carefully rubbing with your finger to remove the paper. Be very careful not to dig into the picture. Make sure all the paper is remove before moving to the next step. 5. Lay the picture down onto cardstock and burnish. Make sure it is totally adhered to the card stock before removing the transfer sheet. Cut the card stock larger than the picture so it can be cut with a die. 6. Cut with a decorative die that is the shape you want for the card. I haven't tried it yet with a magazine print, but I think that might work too. Lots of possibilities. Have any of you done this or seen it. I haven't, but I don't get to look at lots of web sites. Please let me know what you think by leaving a comment. You will have until next Thursday, September 26th morning 6:00 AM EST to link your project. A winner will be chosen from a random drawing for week #38 the winner of the challenge will be announced Friday, September 27. This week's winner will receive a Memory Box Die. The winner will also be entered in the 2013 end of the year $100 gift certificate drawing. Oh my goodness Joan ... this card is STUNNING!!! What a clever idea ... I will be giving it a try first chance!! Again ... absolutely beautiful and sounds like a fun challenge too! Well done! Keep up the awesome work ... your creations are always so beautiful and unique! I've never seen the transfer paper you used before so this technique is new to me and I DO visit TONS of blogs and websites of all kinds so I am usually aware of most new techniques. I have used wide packing tape to transfer magazine pictures. Lay the tape over the picture. Soak it in water, as you did, and rub away the paper. Blot it dry . Then adhere to card stock. I learned this many years ago.I've heard that it also works with any image copied on a copier that uses toner. It will not work with an ink jet copy. Beautiful card, love the vintage looking cards, so shabby chic!! Haven't tried this yet, but now I guess I will have to after seeing this gorgeous card!! 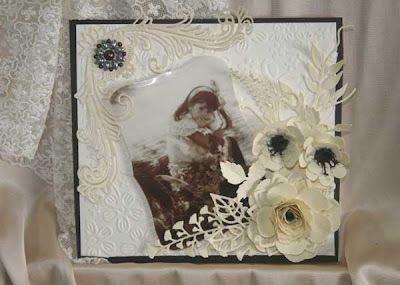 Beautiful card, Joan, I would love to try your technique oneday!